SegmentedGaugeIndicator class is the base class of the segmented indicators. It does not have any visual representation initially and users are expected to populate the indicator with BarIndicatorSegment objects. SegmentedLinearGaugeIndicator and SegmentedRadialIndicator do not introduce any new properties and simply implement the abstract logic of their base class by arranging their segments in circular and linear manners respectively. Length (double): This is a proportional length of the segment. The actual length of each segment will be determined by Length divided by the sum of all the segments' lengths. Thickness (double): This is the thickness of the segment. The concept is the same as the thickness of a line, or a circle. Stroke (Brush): This is the color of the segment. This property is of type Brush. 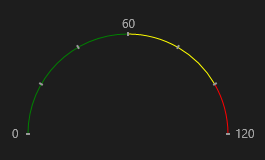 The following code sample demonstrates how to implement a RadLinearGauge with a SegmentedLinearGaugeIndicator and three colored BarIndicatorSegments. The following code sample demonstrates how to implement a RadRadialGauge with a SegmentedLinearGaugeIndicator and three colored BarIndicatorSegments.